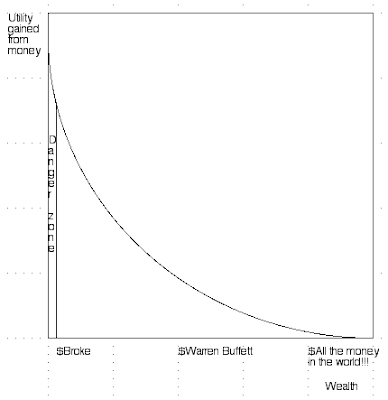 Just as for any other asset, the marginal utility of money is a decreasing function. But the marginal utility of money inevitably decreases at a slower rate than any other asset because money can be used to purchase all other assets. Compare the marginal utility of gaining money to the marginal utility of gaining carrots. At a certain point, one can have too many carrots, especially since, as perishable goods, carrots cannot even be converted to cash once they go rotten. But money never rots, and can easily be converted into whatever one desires. So the marginal utility of money will only approach zero once one has literally satisfied all desires, including the desire for unconventional things like giving to charity. Nonetheless, there are important conclusions to be drawn from the fact that the marginal utility of money decreases. To understand the concept of the individual's decreasing marginal utility of money, consider the difference between Person A with $4000 in the bank, with $1000 rent payable due in a week, and Person B with $500 in the bank, and $1000 rent payable due in a week. If Person A suddenly received $600 in income, he would have many choices of what to do with his money, including saving it. If person B received $600, $500 of this would most likely go towards rent, and the remaining $100 would go towards other essential items such as food. My subjective judgment is at work here, but I am sure that many will agree with me when I say that the opportunity costs of not getting the extra $600 would be greater for Person B than for Person A. There are extra costs for Person B that would be incurred by not receiving the $600: in not making rent, or in the health costs of malnutrition. Also, at very low levels of wealth, the loss of money adversely affects one's ability to make money in the future. For example, if someone loses his front teeth because he can't afford to see a dentist, he will probably make less of a good impression at a job interview. This is a hidden opportunity cost that people with low levels of wealth must face. This helps to better illustrate the same phenomenon presented in part 1. It is clear to me that the net benefit of making an investment is not a linear function in relation to one's level of wealth. This is because there are extra costs that naturally arise when one's wealth is at a certain low level. There are unavoidable items, such as basic food, shelter, clothing that everyone must obtain to survive, live with some dignity, and be able to produce wealth in the future. Then there are avoidable items, like MP3 players, which are biologically of a second priority, and do not affect someone's ability to produce wealth in the future. At a certain level, one's wealth will be used exclusively for unavoidable items. (Though people suffering from addiction and mental illnesses may avoid these items in favor of others.) It is apparent that the cost of being without food for a week would be greater than the cost of being without an MP3 player. All types of investments can be a problem for people at lower wealth levels. As we have seen, if one accepts that the marginal benefit of having money is a decreasing function, one must accept that those with lower wealth will face greater marginal costs involved in any given investment. The marginal benefits of investments will also be greater at low wealth levels, but in smaller proportion than the costs. For everyone, there lies an economic danger zone, at the point where basic needs cannot be sufficiently satisfied by one's funds. All wealth from $0 rising up to the edge of this danger zone must be in a liquid form to satisfy current essential needs. Even risk free opportunities for profit would not be taken by rational people who simply cannot afford them because of the need to maintain a certain balance of liquid wealth. To escape the perils of the danger zone, and make profitable investments, such as those in vocational training, or a new car to help a job-search, one may resort to borrowing, but clearly there are extra marginal costs involved with this, e.g. interest due. Those with sufficient wealth can better avoid borrowing. Those with enough money to avoid the danger zone are free to take greater risks and reap rewards for doing so. Thus, the rich get richer.